The K9AY Array by Gary Breed is a great low band receive antenna for hams with limited space. Even though I have room for a couple of Beverage antennas, the K9AY array at my QTH gets a lot of use. This antenna is originally described in the September 1997 issue of QST. 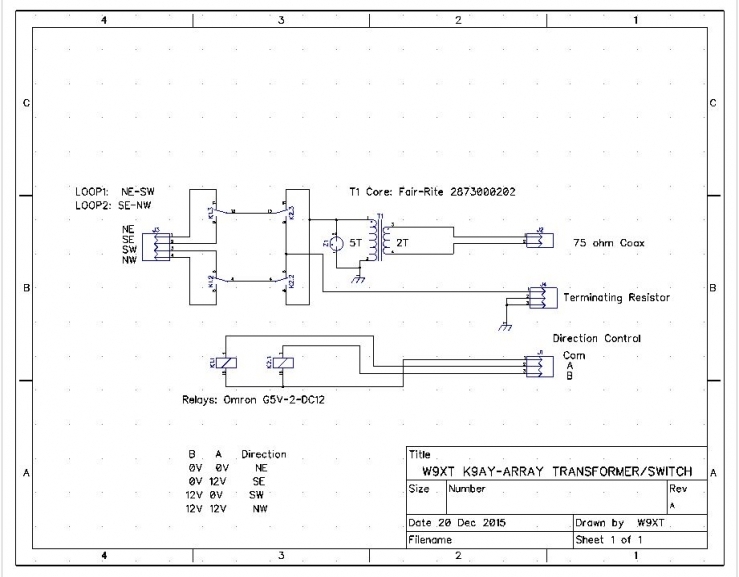 The original article had a diagram for the transformer and switching system. The one used here at W9XT is a bit different from the one in the article. First of all, a different transformer is used. The original article used a tapped transformer to convert the loop impedance of approximately 470 ohms to 50 ohm coax. It is now recommended to use a transformer with separate primary and secondary windings to reduce noise pick up. 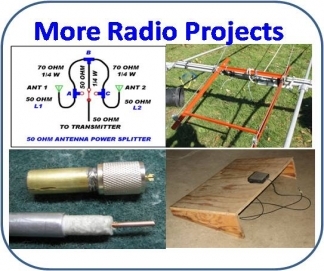 I use 75 ohm RG6 coax for my low band receiving antenna system. RG6 is used for routing VHF and UHF TV signals so will have very low loss in the single digit MHz range. Also since it is produced in such large quantities, it is inexpensive. The transformer uses a Fair-Rite 2873000202 binocular ferrite core. The antenna winding has 5 turns, and 2 on the coax side. This provides good impedance transformation to the 75 ohm feed line. 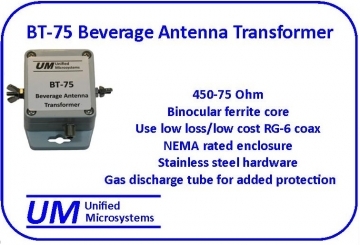 This is the transformer design used in the commercially available BT-75 Beverage transformer. An optional gas discharge tube is wired across the transformer. Over the years I have lost a lot of Beverage transformers if I didn’t disconnect them in the summer. The gas discharge tube helps protect the transformer from surges created by nearby lightning. Since using the tubes the last couple of years I have not lost any despite leaving them connected all summer. Knock on wood. The K9AY Array uses two loops at right angles. By switching loops and which side the terminating resistor is connected, 4 directions are possible. Most hams in the US have them pointed NE, SE, SW and NW. Breed’s article described a system that didn’t require separate control cables for direction control. Two relays make the switch network. Powering none, one, the other, or both of them allow selecting the 4 directions. His system used +12V, -12V and 12VAC applied to the coax to power the relays. The shack control box for my low band receiving antenna system is powered by a large 12VDC power supply that powers a number of my accessories. I didn’t have AC voltage available. Also, I remotely change the value of the terminating resistor which helps null signals from the rear, so I already had a control cable running out to the antenna. 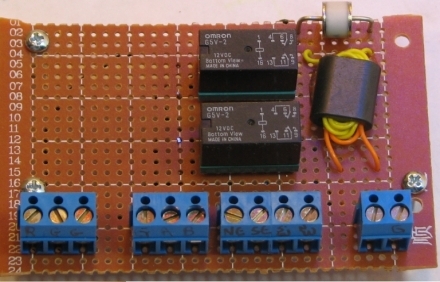 My design simply applies power to the individual relays as needed to get the desired direction. 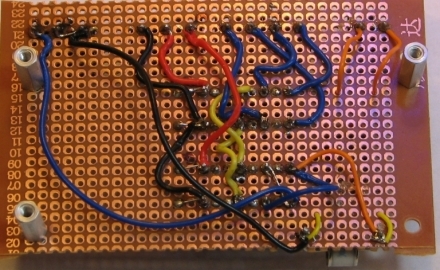 The circuit was assembled on perf board with point to point wiring as shown in the pictures. The relays are in sockets to make replacement easy if necessary. High quality machined pin sockets are used. Wire the relays directly if you are not planning on using the best sockets. The transformer is mounted to the board with silicon cement. Screw terminals make it easy to attach the various wires. This design incorporates a few features that differ from the original K9AY QST article. Maybe you will want to incorporate some of them into your system.